Maps Marker Pro v2.2 focuses on security by fixing one medium-critical security vulnerability and by providing security improvements to the update process amongst other improvements. An update to the latest version is – as always – highly recommended. Please read below for more details. Let me know what you think about this new release by submitting a review or leaving a comment below! Maps Marker Pro has also been configured to work out of the box with those icons (you can even use the integrated upload feature to easily enhance the default icon set shipped with Maps Marker Pro). In order not to run into any issues with the payment process, some pages like pricing, store or customer area are initially excluded from the mobile version of the framework. If you run into any issues on your mobile device, please let us know! Starting with the next release, Maps Marker Pro plugin updates will be fetched from mapsmarker.com via encrypted https connections. This helps ensure the integrity of the package and the authenticity of the sender, making the overall update process more secure and trustworthy. For customers with outdated https configs on their servers I added a fallback to deliver update packages via http. Anyway if you see that the next update after v2.2 is loaded via http only, I would advise talking to your hoster and asking to verify respectively update your servers security configuration. Many servers hosting WordPress still use old PHP versions (which is not directly an issue for Maps Marker Pro as the minimum requirement is PHP 5.2), but as the support for PHP 5.3 was discontinued recently, still using a version below 5.4 is potentially insecure for your whole site and an update to 5.4 (or better even higher) is highly recommended. To address this issue, a new project called wpupdatephp.com by Coen Jacobs was started, with the aim to make end users aware of this issue. Within the codebase of a widely used SEO plugin a vulnerability was discovered recently which allowed authenticated SQL injections. We used that info to check our code for vulnerabilities of the same type. As a result we found and fixed a medium critical vulnerability that only allowed admin-authenticated SQL injection (in contrast to the SEO plugin where author, editor or admin roles were affected). The one sentence explanation for the not so technical user: a logged-in admin user could save a special command in the recent marker widget which could change the database. This vulnerability does not allow mass hacking of installs as it requires access to an admin account. Although hackers (respectively crackers) having access to a compromised admin account will most likely use more direct and easier ways to change the database or even files (which was not possible with the vulnerability now fixed), this vulnerability was considered as a serious issue and working on a fix was started immediately after it was discovered. Why we didn’t catch it? Well…unfortunately this issue was not caught in one of our external security audits and our regular internal reviews did not catch it either. The values were escaped using esc_sql, which one would expect would prevent SQL injection. It did not in that special case, as the SQL query for the recent marker widget needed stricter sanitization. Not an excuse but it’s a good lesson to learn for other developers too and for the future. Please understand that I am not being able to promise any release dates for new features. 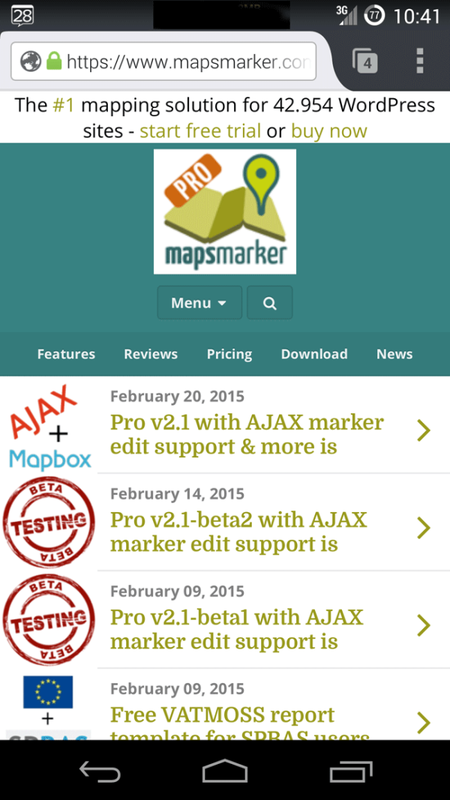 The roadmap for major new features gives you an idea where Maps Marker Pro is heading – anyway I just would want to keep the flexibility to add optimizations and bugfixes with rather unplanned minor releases resulting mostly from users feedback.